Do gender dynamics in agricultural development contribute to nutrition? How do gender dynamics and decision-making relate to nutrition-sensitive behavior and outcomes in agricultural development programmes? What is the impact of empowerment on nutrition sensitive agriculture programmes? How can we continuously and systematically track impact of gender participation in agricultural development on nutrition? What is paradoxical is that we actually know that gender dynamics often are closely linked to nutrition, but we don’t necessarily always know how! These concerns were the focus of a two and half day training workshop on gender and nutrition organized by the CGIAR cross-cutting research program (CRP) on Agriculture for Nutrition and Health (A4NH). The event took place at Bioversity headquarters in Rome, Italy on 2-4 December 2014. Participants from different sectors shared experiences on designing, implementing, and evaluating gender research analyzing how development activities have contributed to improved nutritional outcomes. I was happy to be invited in the capacity of one of the key partners who is working on implementing nutrition-sensitive agricultural projects. Women's empowerment has been portrayed as a driver in agricultural development and innovation especially in poor rural setting. This is reflected in IFAD’s core business of investing in rural poor with an estimate of approximately 50 per cent of women targeted in our operations. Empowering women involves multiple aspects such as decision-making power related to income, time, labor, assets, and knowledge or preferences of female community members. 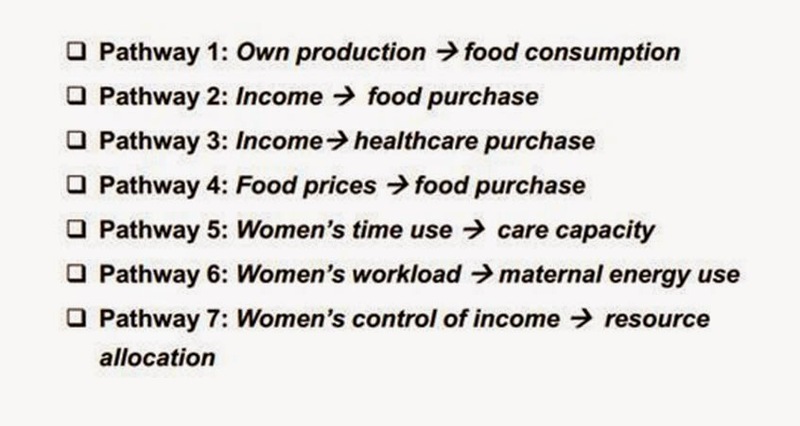 This implies women taking control over their lives, setting their agenda, gaining skills, self-confidence, self-reliance. Hazel Malapit, the coordinator of A4NH gender strategy in IFPRI, gave an overview of the Women's Empowerment in the Agriculture Index (WEAI). WEAI is an index dedicated to measuring women’s empowerment in the agricultural sector. Laurie Starr (TANGO International) and Ana Paula de la O Campos (FAO) shared experiences in using and adapting WEAI were shared in project contexts. Beatrice Gerli, a member of IFAD gender team also added that IFAD has developed an adaption of the WEAI in its work and piloted it in Guatemala. To understand the intricacy of women's empowerment Peter Davis, a specialist in qualitative and mixed-methods research delivered a presentation on empowerment ‘as a complex topic’. Further in this workshop, we discussed the “7 key pathways” through which agriculture is thought to influence nutrition. These pathways were grouped into three key routes: 1) Food pro¬duction; which affects food availability, access and consumption of diverse foods and food consumption at household level; 2) Agricultural income; which influences expenditure on food, healthcare and non-food items; and 3) Women’s empowerment; which influences decision making power, caring capacity and practices, control of income and female energy expenditure. As a matter of fact, empirical evidence suggests that empowering women improves nutrition for mothers, their children, and other household members and there is a close linkage between child stunting and maternal nutrition. From a nutrition perceptive, the decision making process was viewed not just an outcome but rather underscoring the importance of joint-decision making between women and men. Participants engaged in a brainstorming session on coming up with decision-making indicators to enhance their understanding of gender dynamic roles in agricultural interventions for nutrition and health. Jessica Raneri, a nutrition specialist in Bioversity talked about adapting existing methodologies with a nutrition lens, thus ensuring nutrition-sensitive interventions. She proposed that we reformulate existing questions and/or integrate additional questions on nutrition from a gender perspective to address gap in current methodology. Jody Harris, a Senior research analyst/nutritionist on A4NH in IFPRI, discussed the context specific linkages between agriculture and nutrition. She went further by stating that "quality of food and diet are key for measuring outcomes of agriculture for nutrition and health’. She also emphasised on the need for ‘do no harm’ indicator to measure the expected change in projects particularly on women’s time, care giving, programme participation. It was quite interesting to see how gender mainstreaming can improve nutritional outcomes in Ag4NH programmes. While at the same time implementing agricultural development projects through a nutrition lens maximizes the gender norms. “Wow! Now it’s all making a whole lot of sense, Steve!!! To wrap up the workshop, participants were tasked to identify available and missing resources to improve work on nutrition and gender. One of the challenges identified was creating a space to continue networking opportunities to link up gender and nutrition. As a way forward, participants suggested to build a community of practice on gender and nutrition in order to continue the conversation. This training workshop actually confirmed that integrating gender norms through a nutrition lens will increase development impact and nutritional outcomes of programmes. 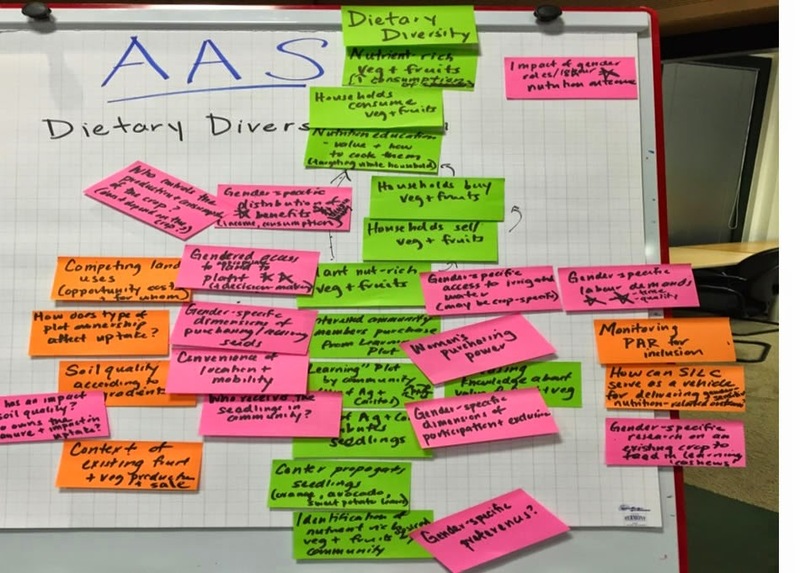 It was an opportunity to further our understanding of influential gender dynamics in nutrition sensitive agriculture interventions particularly for partners like IFAD where gender and nutrition are among our thematic corporate priorities. Interested in IFAD’s commitment to making its country programmes and projects nutrition- sensitive? Read our blogpost on Optimizing farmer’s contribution through better health and nutrition. Rural transformation needs holistic approaches?